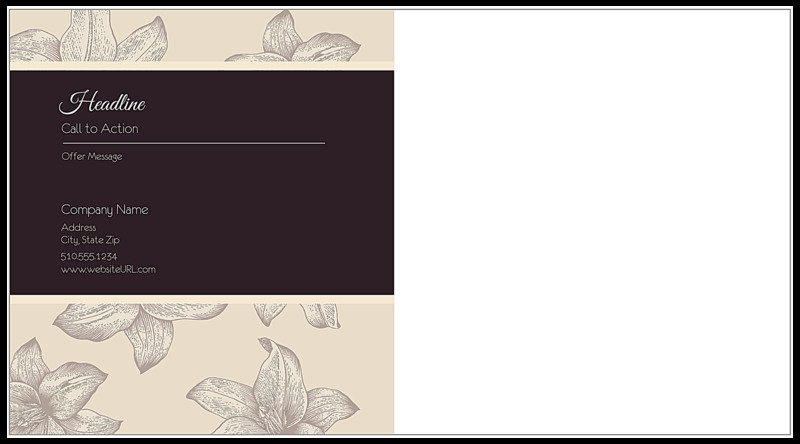 Our Wining and Dining postcard design template is perfect for wineries, tasting rooms, restaurants, bars, and entertainment venues that want to add a touch of elegance to their direct-mail marketing campaigns. 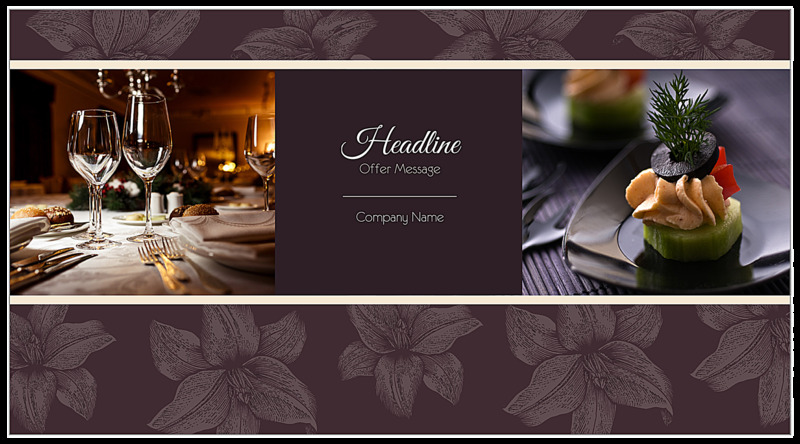 The front puts your headline message, offer, and company name front-and-center in a shaded square flanked by two custom images; all within a bold border against a flowered background pattern. On the back, you’ll find your headline text in script over your call to action and offer message. The background mimics the front in reverse colors. Customize Wining and Dining with your choice of four different color palettes, three elegant shapes, and our online postcard maker today! Print custom postcards using our Wining and Dining postcard design template – no graphic designer needed! All you have to do is select your template, color scheme, and postcard shape. Our online design tool then walks you step-by-step through personalizing your postcard text and uploading your own images. It’s fast, easy, and free! You can even generate a free PDF to share before you go to print so you can be certain your finished postcards look exactly as you intend them to. With premium paper stock and high-quality printing by PsPrint, you can rest assured your postcards will look and feel amazing. In fact, we guarantee your satisfaction! Find out why thousands of businesses trust PsPrint with their custom postcard printing needs every single day. PsPrint’s custom printing team is on-hand to help you print personalized postcards. Want to enhance your design with custom foil stamps? No problem! Have a unique die-cut postcard shape in mind? We can do it. Need mailing list generation, postcard addressing, and complete postcard mailing services? We’re your one-stop shop!